Marco Amenta's The Sicilian Girl is a mafia drama, but one with a different point of view than we're used to in the genre. The Italian film stars Veronica D'Agostino (Respiro) as real-life mafia daughter Rita Atria, who in early 1991 turned over her personal diaries to prosecutors as an act of revenge against the gangsters who killed her father and brother. It was a monumental case, and the teenager going against her own was seen as a colossal act of betrayal. The Sicilian Girl chronicles what lead up to this brave act and what happened to Rita after. Don Michele is eventually killed by the man Rita knows as Uncle Salvo (Mario Pupella) because Salvo wants to move the family business into drugs, which Michele sees as a dead end. Rita and her brother (Carmelo Galati) plot their revenge over the years, with Rita documenting Salvo's every move in order to pick the right time for action. Her brother is betrayed and killed, however, forcing Rita to make a different choice. That's when she goes to Palermo and enters the witness protection program. Her testimony would cost several lives, but it ultimately led to a huge trial and multiple convictions. The bulk of The Sicilian Girl is what she does after leaving her home and how it changes her. The script here, by Amenta, Sergio Donati (Schwarzenegger's Raw Deal), and Gianni Romoli (Cemetery Man), is short on fireworks. The drama is dry, though it does move step by step with purpose. Many of the situations are ones we've seen before, but Amenta pulls them out of the more sensationalized fictions and labors for an air of authenticity. This tactic works thanks to the remarkable performance by Veronica D'Agostino. The young actress has a lot of spirit, but she also has a lot of sensitivity, allowing her to understand the fire that burns inside Rita but also to empathize with her sadness. As The Sicilian Girl progresses, Rita begins to change. Her illusions of her childhood and the black-and-white "cops bad, family good" morality slowly dissipate as she realizes how deep the violence goes. In particular, she has to let go of the sterling image she has of her father. The evidence is too great to continue to pretend his hands were clean. 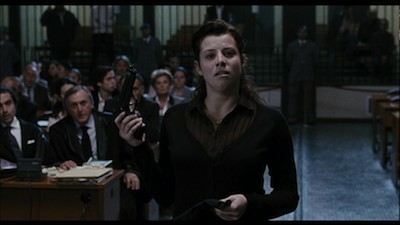 I could have done with some more scenes in the courtroom in the latter part of the movie. Italian courts are fascinating. The accused mafiosi, and there were a lot of them, were kept in jail cells all around the hall, watching Rita as she stood up and defended her diaries. The only other time I remember seeing this kind of setting in a movie was Francesco Rosi's 1962 political piece Salvatore Giuliano. I note this as an aside, and not really a complaint, as I understand that Amenta didn't necessarily make The Sicilian Girl for audiences that aren't familiar with Italy's justice system. That would be like an Italian critic writing a review where he gripes that an episode of Law & Order doesn't have enough of the Order. An American reader would respond that, living here, we've seen plenty of that elsewhere in our entertainment, it's old hat. If I were to really complain about something (and I guess I'm about to), it's that Amenta's quest for realism ends up hurting him as much as it helps him. There is some natural melodrama in Rita's story, and he maybe labors too hard to keep it at bay. Particularly in the conclusion, which hinges on a rash act inspired by a broken heart, The Sicilian Girl could have bore the weight of some high-volume histrionics. Even better, had Amenta unleashed more of Rita's passion and anger, it might have also helped her endgame decisions make a little more sense. We get it, it works, but it might have worked better were it not so coldly rendered. Music Box brings The Sicilian Girl to DVD in 1.85 anamorphic widescreen. The image quality is excellent. The film is mostly dark and gray, and the shadows and light have good balance, including different levels of black that add to the mood of the piece. The cinematography is by Luca Bigazzi, who also shot Paolo Sorrentino's Il Divo. His work here is far more considered than the outrageous, flashy look of that film, and the justice done to his photography on this disc allow for an excellent contrast. The two movies couldn't be more opposite, and it really shows Bigazzi's range as a director of photography. The original Italian soundtrack is mixed in both 2.0 and 5.1, with some good effects in the fancier mix, giving the movie a realistic aural atmosphere. The English subtitles flow well and don't move too fast. The DVD comes with a 23-minute making-of featurette, featuring the expected cast and crew interviews on top of clips and on-set footage. Naturally, it also has background information on the real story that informed the film. The original theatrical trailer for The Sicilian Girl is included, as are trailers for other Music Box films, including Mesrine and the Stieg Larsson trilogy. Recommended. The Sicilian Girl takes a common mafia story and turns it into an uncommon tale of a young woman breaking free of her past and looking to end the cycle of violence that took her family from her. Anchored by a remarkable performance from Veronica D'Agostino, the docudrama takes a scaled-back approach, focusing on real-life mafia daughter Rita Atria's humanity rather than the blood and guts. Sometimes the presentation is maybe a little too chilly, but overall, it's a smart picture that delivers deeper themes in an aesthetically pleasing way.